As is our human nature when faced with violent acts, people reacted with horror, sympathy, and an aura of nervous energy after the Boston Marathon bombing. Whenever there’s a tragic event, whether it’s a bomb, a plane crash, or a tornado, most of us feel like we should do something to help those affected. Even if we’re far away, even if we’re not directly connected to anyone who was hurt, there’s this spark of humanity inside us that drives us to action. It’s crucial to note, though, that not all helpful actions are necessary, and not all good actions are immediately helpful. Many people in my Twitter feed were urging people to go and donate blood. I am an occasional blood donor. I encourage people to be regular – for their own personal definition of “regular” – donors. 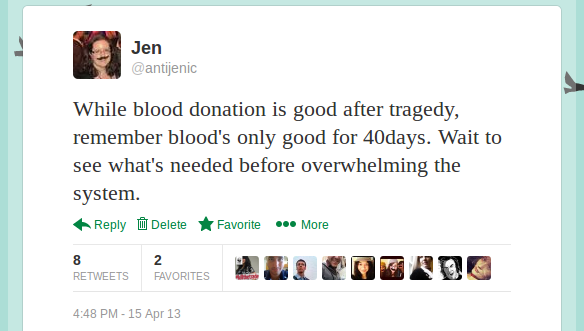 But this week, when I saw the flood of “go give blood” tweets, I cautioned against rushing to the donor centers. Why? People were horribly injured and being rushed to hospitals for surgery. Didn’t they need blood? Yes, many of them likely did. But the hospitals were prepared. Every hospital has a plan in place to help them deal immediately with an “external disaster.” They keep a good supply of blood on their shelves, and they have means to get more very quickly. An organization like the American Red Cross* can move blood products efficiently from one area of the country to another. It happens every day, even in calm and peaceful times, but in an emergency, the wheels turn very quickly to get blood products to where they are needed as fast as possible.There seems to be an almost-constant “blood shortage” going on, so it does seem confusing when Red Cross officials tell people not to come in right now and donate. What’s important to understand is that the key to having enough blood available for a crisis is to have an adequate blood supply at all times. That’s why the Red Cross encourages regular donations: the need is constant. So why isn’t more blood better? Why is the Red Cross of Eastern MA asking people to please wait and come in next week if they want to donate blood?The thing about blood is that if you go to the donor center right now and roll up your sleeve, and have a unit taken from your veins, that blood will not be used immediately. It needs to be tested for HIV, Hepatitis B and C, West Nile Virus, and all sorts of other things. There’s a two-day turnaround for blood products. Donating blood during a crisis isn’t necessarily going to help the victims of that particular crisis. The Red Cross will do its best to accommodate all the generous donors inspired by the tragedy, but there’s a risk involved with a huge rush of donors at one time. Blood is perishable. Units of blood get a 21-to-42-day expiration date. So what happens a month after the crisis, when everyone’s just donated but all the blood is about to expire? Nobody wants to see blood wasted. And that’s why I urged people to wait and see whether there was a need before rushing to donate. Replenish the supply by donating a little later, so that there’s always blood available for everyone who needs it. What can you do to help when disaster strikes, then, if you shouldn’t give blood? Don’t misunderstand me! Do donate blood. Please do. It saves lives and nobody would argue otherwise. But don’t rush in after a disaster. Wait. See if the American Red Cross puts out a call for donors. If there is no immediate need, make an appointment a week in the future, or two weeks. Give often. Help keep the supply constant so hospitals can do their thing when they need to. Follow @RedCross on Twitter or like them on Facebook. When something is happening, those accounts are very active and are an excellent source of news and support. There are accounts and pages for local Red Cross areas, as well. They will tell you how you can help. Learn CPR and first aid. If you’re ever in a position to give more direct help to someone injured in an accident or attack, you will be more confident and better equipped to act. *I use the American Red Cross in my examples because I have a familiarity with their processes thanks to my work experience, and because they are a very important blood supplier for much of the United States. I don’t claim to speak for them in any official matter. This entry was posted in Public Service Announcement, Science and tagged blood banking, blood donation, PSA, tragedy on April 19, 2013 by antijen.